First of all apologies for the quality of the photographs on this page, I clearly need to work on my photography skills. Normally photographs like these wouldn’t make the website site however they did capture the stain quite well so I thought they would be worth including. 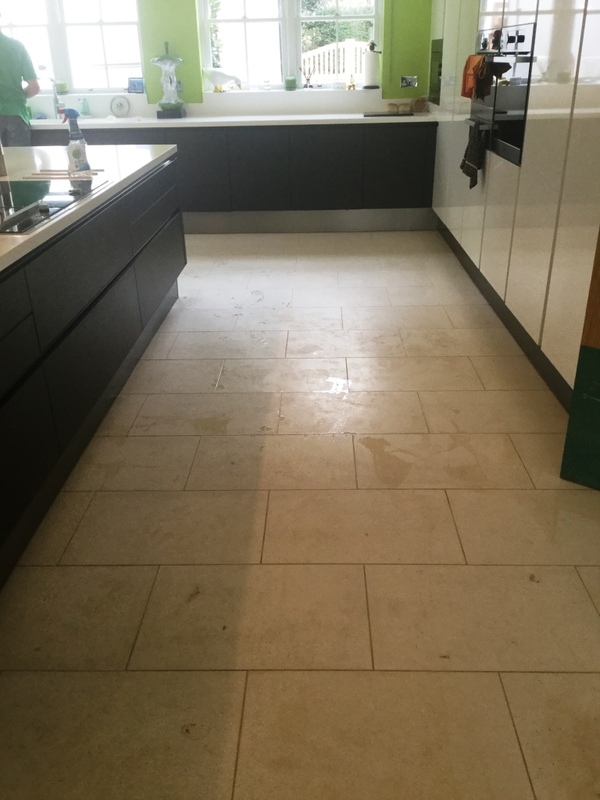 The customer who lives at a large house near Tutbury had a spillage on the lovely Limestone floor tiles in her kitchen which she tried to clean with different chemicals including bleach which just made the problem worse. The trouble with bleach is it’s a strong acid which will eat through the sealer on your stone tiles, which in this case resulted in whitish circles you can see in the middle of the photograph below. The tiles were overdue a deep clean anyway so the owner called me in to renovate the floor and hopefully remove the staining. 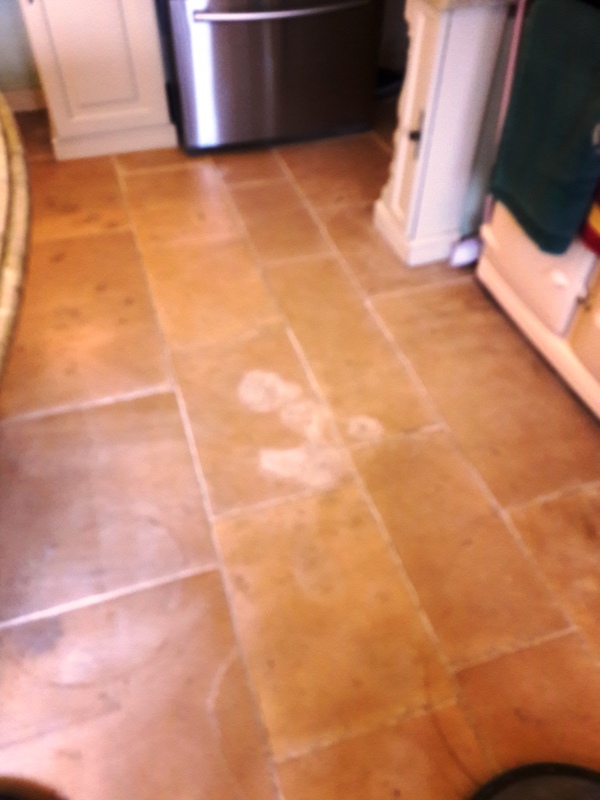 I started the process by giving the floor an initial clean with Tile Doctor Pro-Clean which is a strong alkaline tile cleaning product. This wouldn’t address the staining problem but my intention was to get the grout clean and also remove any surface dirt and grit from the floor. The cleaning solution was scrubbed in and then rinsed off with water which was then extracted using a wet vacuum. 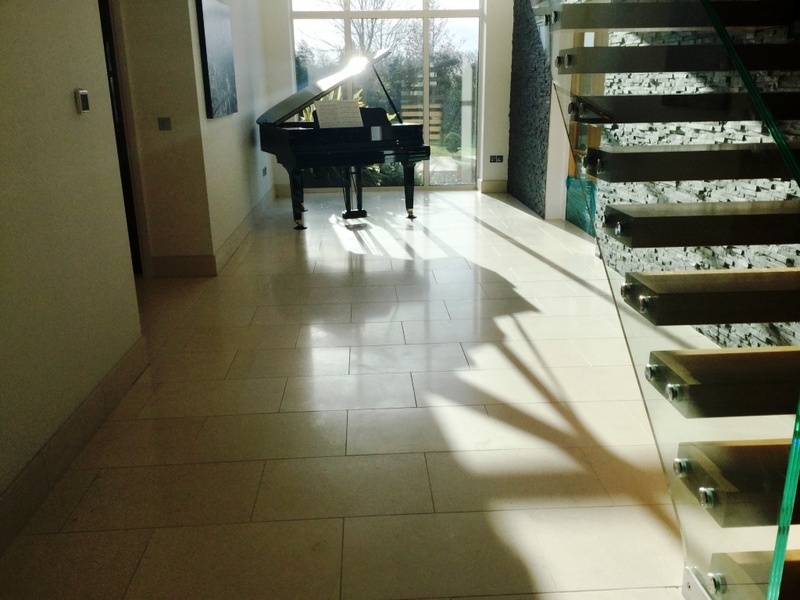 The best method for restoring the appearance of Limestone floor tiles requires stripping back the surface of the tile and then building back the polish of the stone using a process we call burnishing. To do this we use a set of diamond encrusted pads which come in different grades from coarse to very fine. The pads are applied using a floor buffer machine and each pad does a different job and you start with the course red pad together with a little water and then carry on with the white, then yellow pad again using a little water removing the soiled water along the way. Although the floor now looked great the bleach had done more damage than first anticipated and had stripped the stone of its natural oils where the spillage had been. 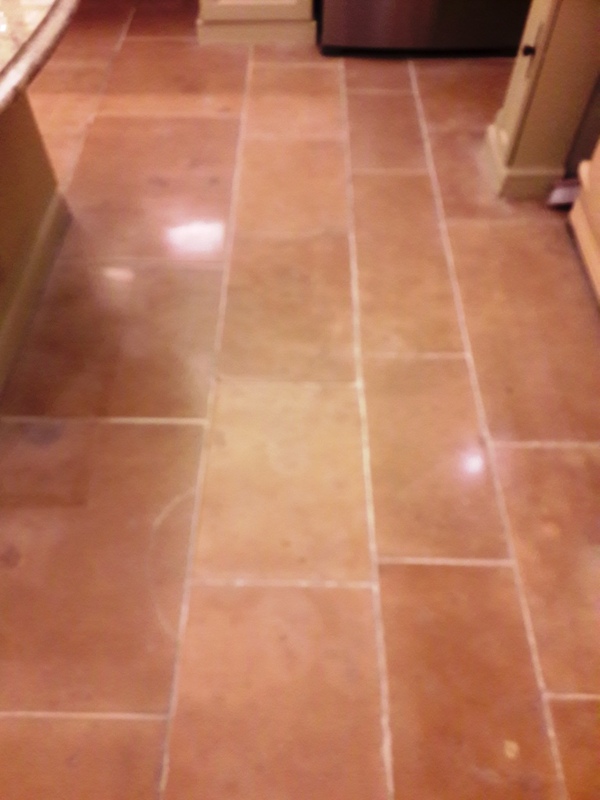 To rectify this I applied Tile Doctor Stone Oil to the floor which I’m happy to say resolved the problem. 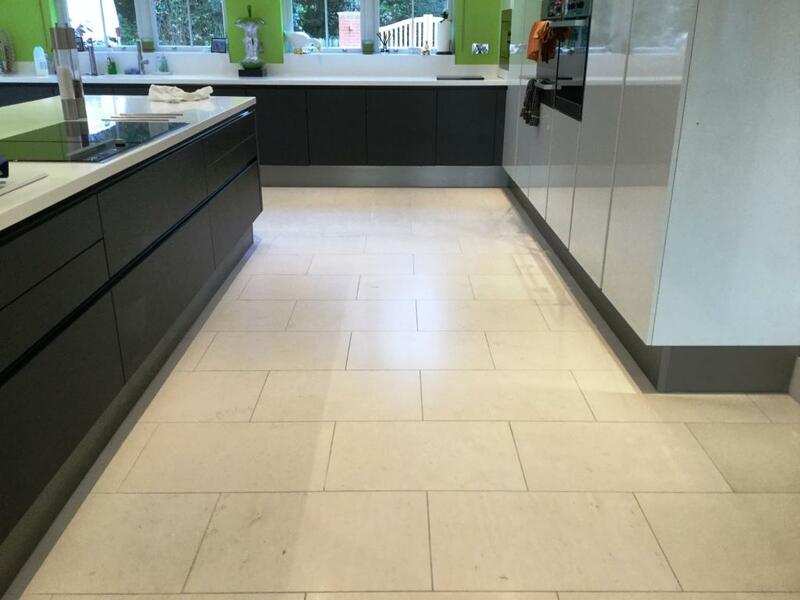 Once the Stone Oil has soaked in I followed up with the application of Tile Doctor Colour Grow which is a specially designed stone sealer that penetrates into the pores of the stone protecting it from within whilst enhancing the deep natural colours in the stone. The floor was then left for about one hour to dry before working in Tile Doctor Shine powder with a white buffing pad to give a really deep robust finish. The floor was transformed after I had finished and before leaving I made sure to advise the owner on the correct way to maintain her floor in future. 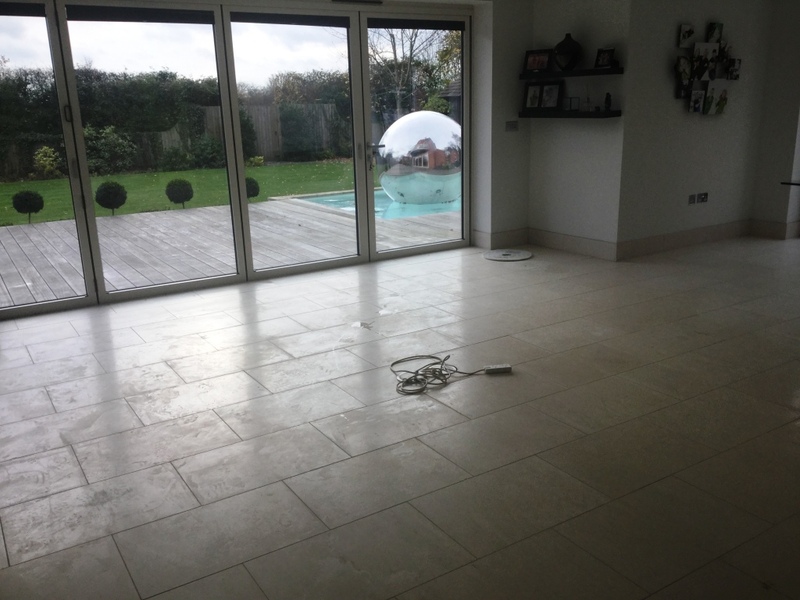 The client from the Bedford village of Biddenham had requested a quote to restore the look of their Limestone floor tiles which were laid throughout the whole ground floor including lounge, hallway and kitchen covering approximately 120m2 in total. The floor needed a thorough clean, filling of holes in high traffic areas followed by polishing and then sealing. Over time, the floor in this busy household with 2 large dogs had become dirty and certainly worse for wear with all the use it had been getting. A quote was given and accepted and work was booked in to be carried out over 4 days with 2 Tile Doctor technicians on site for 2 of those days. 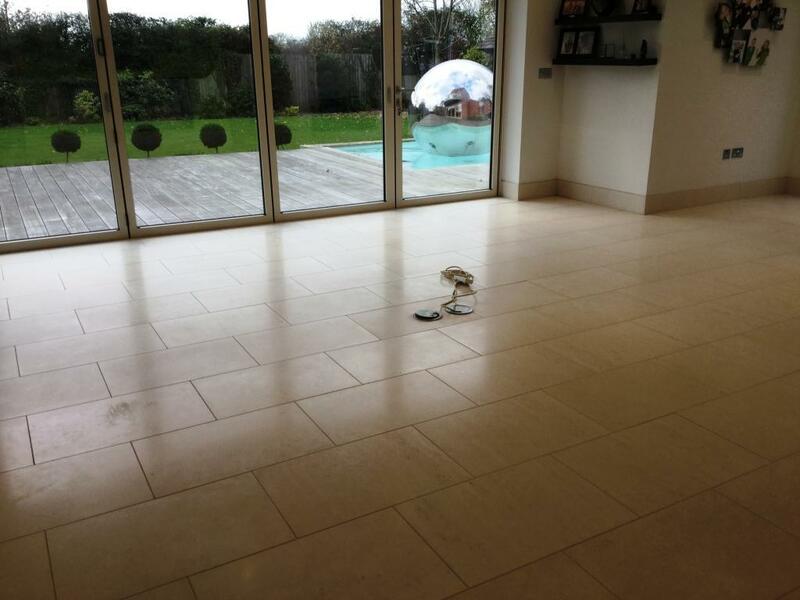 We returned on the agreed date and started work to get this floor back to looking its best. My initial task before beginning the cleaning process was to apply a protective wrap around the oak doors and moving heavy furniture with sliders that the client couldn’t move themselves to give us a clear area to work in. We then applied Tile Doctor Pro-Clean, diluted with water, to the floor. 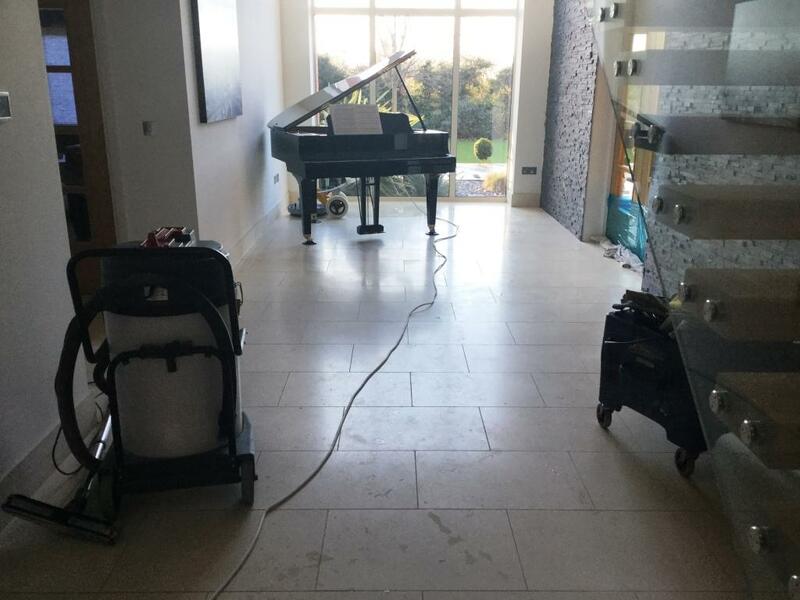 Pro-Clean is a strong alkaline cleaner that is suitable for use on all natural stone floors such as Limestone, Slate and Travertine. After leaving the solution to dwell for a few minutes, We began to scrub over sections (Approximately 10m2 at a time) with a 17” scrubbing pad fitted to a buffing machine, whilst helping to remove a lot of the built up dirt on the surface of the tiles, the products also stripped off the old sealer, this was then rinsed and removed using a wet pick up machine. Following this we paid special attention to the grout lines, scrubbing with grout brushes and Tile Doctor Grout Clean-Up. After completing the cleaning, I rinsed the floor again with clean water to remove any excess cleaning products. I then began to burnish the floor using Tile Doctor Diamond encrusted burnishing pads. This was done in four steps, as I used four different pads (coarse, medium, fine and very fine) rinsing the floor with water between each pad. Starting with a coarse pad and then gradually working up to the very fine pad achieving a high polish finish in the process. I finished off the process with a quick rinse and a white buffing pad to give the floor a final polish before I commenced the sealing of each area the following day to allow grout and stone to fully dry overnight. The client requested a natural look finish so my choice of sealer was Tile Doctor Ultra Seal which will protect the floor but not change the colouring in any way. The sealer penetrates deep into the pores of the stone, providing water resistance and long-term protection from ingrained dirt and stains. This was a large area so it took some time to complete but it was well worth the effort, certainly the customer thought so and left the following feedback on the Tile Doctor Feedback System. Phil and his team were polite, friendly and professional at all times. Nothing was too much trouble for them and they worked very diligently to ensure they got the best possible outcome and the floors l. . . ok better than new at the end. As you can see from the comments the client was extremely happy with the results and he has asked for details of our maintenance plan to keep his floors looking their best for years to come.